The Figure 2 (c/o ETP4HPC) positions the projects ExaNoDe, ECOSCALE and ExaNeSt within the Ecosystem of EU-funded HPC projects (as of March 2018). ExaNoDe has links to a number of other European Projects, specifically in the context of the FET HPC research programme (see figure). There are particularly strong links with the ECOSCALE and ExaNeSt projects, with which a Memorandum of Understanding is in place (see below). The aim of ECOSCALE is to provide a hybrid MPI+OpenCL programming environment, a hierarchical architecture, a runtime system and middleware and shared distributed reconfigurable hardware based acceleration. ExaNeSt is developing and prototyping solutions for interconnection networks, storage and cooling which will be necessary for future exascale supercomputers. The project will then benchmark its newly developed solutions with tuned real HPC applications. On March, 17, 2017 a “Memorandum of Understanding (MoU)” between the FET-HPC projects ExaNoDe, ExaNeSt and ECOSCALE was signed by the three project coordinators. The purpose of this MoU is to strengthen the links between the projects and to exploit common activities and synergies across the projects to create an eco-system where ExaNeSt provides remote access to multi-board prototypes, based on ARM systems, and a hardware testbed for the integration of ExaNoDe’s compute-node daughter boards. 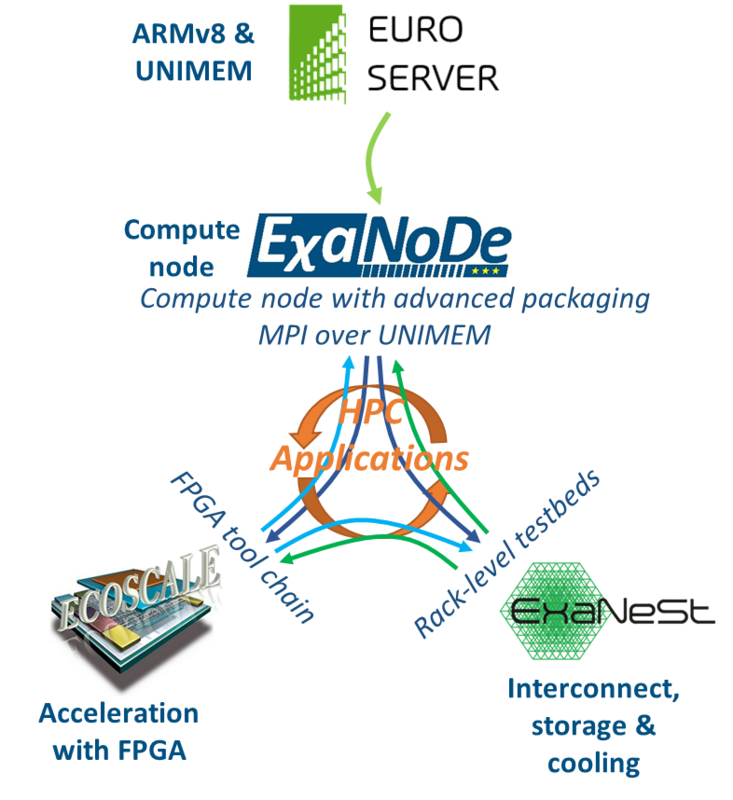 ExaNoDe provides compute-node related technologies, in particular advanced packaging solutions and an implementation of the MPI runtime systems over UNIMEM, a memory model developed in the EUROSERVER FP7 project. ECOSCALE provides the UNILOGIC architecture and the tool chain for FPGA support. The UNILOGIC (Unified Logic) architecture is an extension of UNIMEM providing shared, partitioned, reconfigurable services. The collaboration between these projects has so far led to two workshops, co-organised by the three projects and the EuroExa project which started in September 2017. 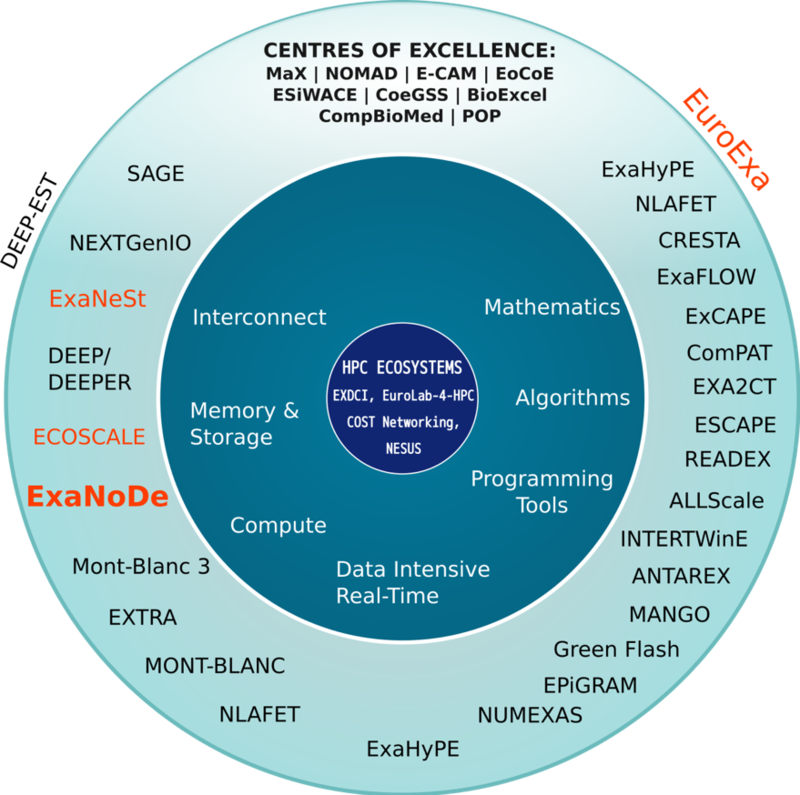 The first workshop “Exascale HPC” took place during the HiPEAC conference in January 2018 in Manchester (see a compilation of ExaNoDe related talks). The second workshop “Towards Exascale HPC systems” took place during the European HPC Summit Week (EHPCSW) in May 2018 in Ljubljana. 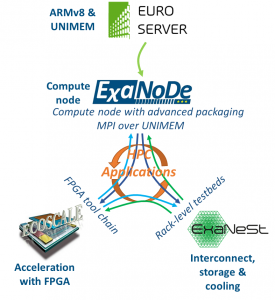 ExaNoDe‘s results will also support the newly started European Processor Initiative (EPI) and Mont-Blanc2020 projects, which are joining the European effort towards exascale computing.